initials of the words Crux sacra sit mihi lux! Non draco sit mihi dux! Support for one another, the parish clergy, and leaders of the wider Church through prayer, tithes, offerings, and service. Use of the principles of spiritual life found in the Rule of Saint Benedict. Pursuit of a closer, personal relationship with Christ through prayer and discipline. Fellowship with others in the Order. On-going development of the gifts of the Holy Spirit through prayer and discipline. The Fellowship Director provides direction and instruction through consistent communication with Members of the Fellowship. He will arrange conferences, group discussions, and other Fellowship activities. He is charged with encouraging common prayers, and fostering participation in the community’s liturgical life and Members’ spiritual growth. Membership is open to any confirmed communicant in the CEC, clergy and laity, men and women, adult and youth. 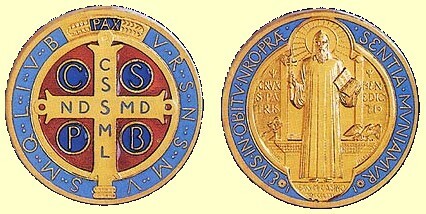 Members promise to lead an enriched Christian life according to the Gospel as reflected in the Rule of Saint Benedict. In this way they share in the spiritual benefits of a disciplined life of prayer and service. The Members strive after stability and fidelity in their lives by regular worship in their local parish. They pledge their support to the clergy and members of the parish, as well as that of the wider Church. If a Member transfers parish membership within the CEC, their membership in the Fellowship can be transferred at the same time. If a member chooses to leave the CEC, his or her affiliation with the Fellowship will end. For more information, use the menu at the left.